It’s here, Black Friday and Cyber Monday knocking on your door again this year. Be aware that those times are also prime time for cybercrime. Every time you are trying to find the best deal, there might be some criminal trying to scam you or even worse, get your computer infected with malware. In order to save you same time, we’ve checked all promotions from our top 5 best VPN providers and pick the best deal of this season for you. And the winner is … 🎉HideMyAss 🎉. Feel free to use discount and save $324 (-75% OFF) for a 3-year license. Be aware that the discount is the difference between paying one time for a 3-year license vs. paying the full undiscounted price every month. 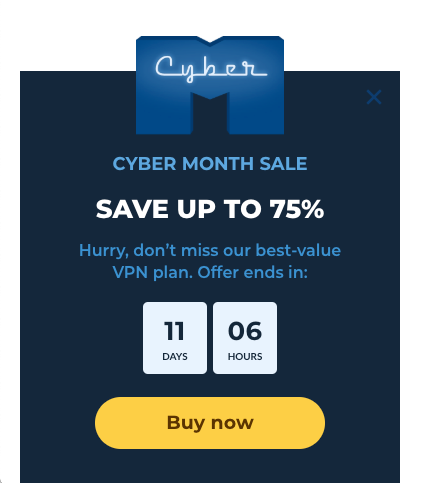 How to get the Cyber Month Discount for HideMyAss? Wait 2 seconds until the pop-up on the bottom-left of your screens appears.